Abbey Burger Bistro – eating my way through Charm City! For as much hype as this burger joint has received, I found it rather disappointing. Although for the record, it’s not a terrible spot to grab some bar food and watch a game on one of the many small TVs. First of all, I give them props for all of the options. I thought for sure, I knew what I wanted and then I kept reading options. Plus, if you don’t like the sound of their signature burgers – you can build your own – choosing from a variety of meats (or non meats), buns, and all sorts of toppings. 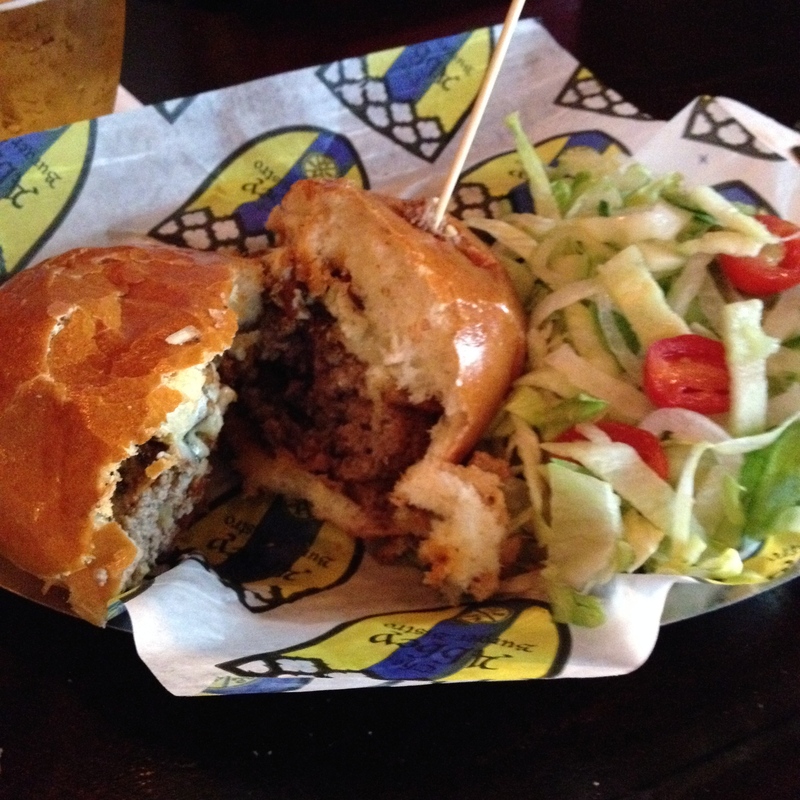 I went for the black and blue burger – a blackened burger topped with bacon and blue cheese. I am avoiding my arch nemesis the french fry for the summer, so I added a side salad. I asked for it medium, and despite my clarifying what Abbey’s medium was, it wasn’t medium; it was a little closer to well, nevertheless still juicy. I thought the burger was good – but quite salty. I like salt, so there has to be quite a bit, for me to notice… I might try a different signature style – and chalk up my disappointment and the salinity to the blue cheese and bacon. Now, I get that this is a burger joint. But, please do not offer a side salad if that side salad is just burger toppings put on the side of a burger. It was shredded iceberg lettuce, sliced onion and a few tomatoes. The dressing on the side was a separated oil and vinegar in ramekin that was too small to mix without spilling oil everywhere. I generally wonder if “best” places can live up to their hype. But, Hamilton Tavern always does. Like the Tea Eats had a little different experience… So I guess we will try again! This entry was posted in Charm City, Dinner, Federal Hill, Meh.. Bookmark the permalink. just had the burger at Myth and Moonshine – hands down the best burger I’ve ever had! Plan to stop by soon – their regular or something special? I disagree completely! I love it there, I went last weekend and it was awesome as usual! It’s so funny, I had such a terrible experience, from service to food. I hear so many great things, that I will definitely try it again.